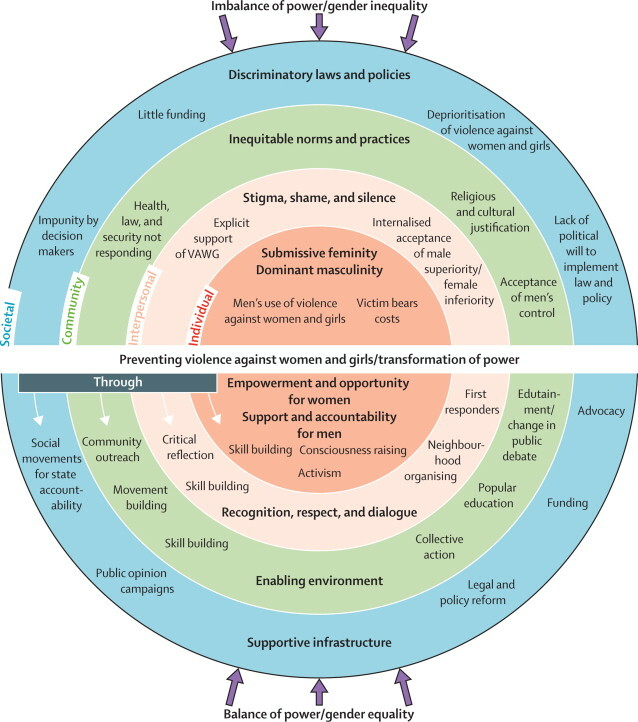 Two of my favorite things about the recent series on Violence Against Women and Girls in The Lancet are that they focus on prevention around the world–including efforts from low- and middle-income countries that often don’t get a lot of attention in the US–and that there is a really strong emphasis in the series on lessons learned from practice, not just from research studies. These two factors come together in “Prevention of violence against women and girls: lessons from practice” to shed some new light on what might work to prevent violence against women and girls. The article essentially summarizes some of the most important trends, successes, and challenges to shed new light on what might work in prevention. Michau et al.’s socio-ecological model (2014). To me, the take-away messages from the article are about addressing the root causes and inequalities that lead to violence against women and girls, thinking big, collaborating to increase impact, and being innovative. Like much of the guidance produced in the US, this article encourages working across the socio-ecological model, and it provides some interesting ideas that we might not always consider. First of all, they included a diagram with suggestions for how to intervene at different levels that are different from the suggestions we often see in the US. They also discuss some particulars about how to focus on each level. Small-scale workshops can make significant change for individuals, but violence against women and girls is such a large-scale problem that we really need to do more. Awareness raising is also important for changing community norms, but they need to have explicit goals and content to change attitudes, norms, and behaviors, rather than just sharing statistics. The article suggests that in order to really make change at the community and society levels, there has to be strong cross-sector collaboration. It encourages collaborations with policymakers, the justice system, the health care sector, and educational systems (at the organizational and policy level, not just in classrooms), as well as closer partnership between prevention researchers and practitioners. The root problems of oppression and gender inequity affect all of these sectors, and the solutions should involve them all, too. Finally, the article talks about the importance of innovation. Even considering some strong programming from low- and middle-income countries, the existing evidence base is small. Some interventions in other countries have led to strong involvement of community leaders, changes in gender norms and expressions, and changes in interpersonal relationships. But we still don’t know how well those kinds of interventions will work here. Perhaps more important than replicating those programs in other countries is to be inspired by the way these programs did things differently, and to think critically about why we do what we do in our prevention programming. Thoughtful analysis of each community’s risk and protective factors might suggest doing something totally different than school-based educational sessions and a social marketing campaign. So what could work better? How can we innovate to find more strategies that create change? You can read more about some innovative programs in other countries and specific recommendations for work at each level of the socio-ecological model for free at the link below. Just create a free username, and you’ll be able to access the article. This Series paper describes programming to prevent violence against women and girls, and emphasises the importance of systematic, sustained programming across the social ecology (ie, the delicate equilibrium of interacting social, institutional, cultural, and political contexts of people’s lives) to transform gender-power inequalities. Effective prevention policy and programming is founded on five core principles: first, analysis and actions to prevent violence across the social ecology (individual, interpersonal, community, and societal); second, intervention designs based on an intersectional gender-power analysis; third, theory-informed models developed on the basis of evidence; fourth, sustained investment in multisector interventions; and finally, aspirational programming that promotes personal and collective thought, and enables activism on women’s and girls’ rights to violence-free lives. Prevention programming of the future will depend on all of us having a vision of, and a commitment to, gender equality to make violence-free lives for women and girls a reality.